Sarah Gerhardt was the first woman to surf Mavericks, a fickle Northern California break that produces 60-foot waves on a strong winter swell. A week before she made history, a select group of men competed in the first surf contest at the iconic break. Since that 1999 contest, there hasn’t been a female competitor in the event, although Gerhardt was an alternate. 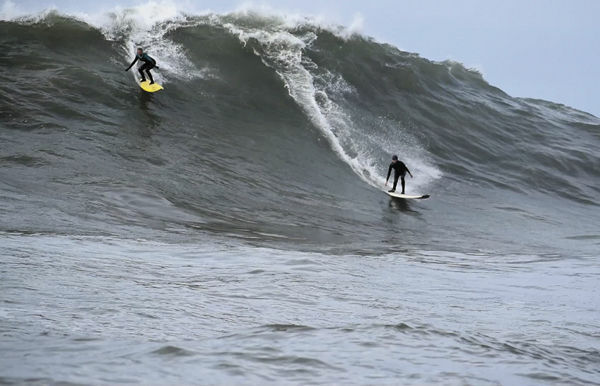 Now, thanks to the California Coastal Commission, the Mavericks big-wave boys’ club has ended. All the people — not just men. The result was the addition of a single women’s heat to this season’s contest. Six top surfers will have an hour to score the best waves for a chance to be crowned the first female champion at Mavericks. Gerhardt is rightly one of those surfers, and she’s “overwhelmed and excited” to be included. At a public meeting on Nov. 2, 2016, in Half Moon Bay, Cartel asked the commission for a four-year permit extension for the event. The issue of women’s inclusion was front and center. There was general agreement that the addition of a women’s heat is a step forward, as is having two women join the five men already on the selection committee. “It’s time to show our girls that big-wave surfing is open to them,” said Mira Manickam, founder of Brown Girl Surf, an organization that aims to increase the participation of women of color in surfing. But is a lone women’s heat enough? A group founded by big-wave surfers Bianca Valenti, Paige Alms, Keala Kennelly and Andrea Moller, called the Committee for Equity in Women’s Surfing (CEWS), doesn’t think so. CEWS member and San Mateo County Harbor Commissioner Sabrina Brennan pointed out that this is not how surf contests are typically run. She said CEWS would like to see a women’s division, with the winners of two qualifying heats advancing to a final held at an optimal time to showcase the women’s abilities, and prize money equal to the men’s division. Cartel argued that there aren’t enough qualified female big-wave surfers for more than one heat. Throughout the day of the meeting, Cartel released the names of the six invited surfers in a trickle on social media, drawing rebuke from one of the commissioners. Notably absent from the final list is Valenti, an outspoken challenger of the male-dominated contest, although she is one of two alternates. Some of the selection criteria, which are the same for women and men, are squishy and subjective, and it’s not unthinkable that politics played a role. Following public comment, commissioner Martha McClure accused the organizers of “living up to the name Cartel.” She and commissioner Mark Vargas took Cartel to task for waiting until the last minute to announce the women’s heat, and for failing to have any sort of plan for their inclusion beyond that. The commission then unanimously rejected Cartel’s application for a four-year extension, granting only a single year. Cartel now needs to come up with a path forward for women’s competitive surfing at Mavericks — not an easy task when the surfers themselves disagree about how many women are capable of safely charging the critical part of the wave on a macking day. CEWS continues to press for multiple heats. Brennan points to the WSL Big Wave Tour Women’s Championship list of 12 women and seven alternates as a bigger pool from which a second heat could be drawn. Gerhardt disagrees. “There are not enough women who are qualified,” she claims, reeling off the names of those who not only charge big waves, but charge this big wave, under their own paddle power. After subtracting for injuries, she came up well short of the 12-plus that would be needed for two heats. She said even a seven-person heat, like at the Eddie Big Wave Invitational in Hawaii, would be hard to run given Mavericks’ tight takeoff spot. Still, Gerhardt has great expectations for the future of women’s big-wave surfing. “Women haven’t reached their peak skill level,” she says. She believes that within five years, we will see more women out at Mavericks, charging harder than ever. Maybe not this year or the next, but soon, there will be a large enough group of Mavericks mavens for the women’s contest to pull even with the men’s. Stay tuned into GrindTV for developments on this story.